by Gerardo Marti, Gladys Ganiel. Oxford University Press, 2014. Many of us have heard much about the Emerging Church movement. In some ways, the phrase has already passed us by. Congregational life is changing that fast in some contexts. Whatever one calls the latest iteration of congregational life, there are new, viable forms of congregations emerging frequently and vibrantly. Authors Gerardo Marti and Gladys Ganiel have captured the stories of many new kinds of congregational life including pub-churches, neo-monastic communities, online networks, and much more. Though these expressions of life together are often rooted in historic practices, they always exhibit new ways of performing these practices. The authors do not debate the strength and weaknesses of these new communities. They do, however, offer rich descriptions. 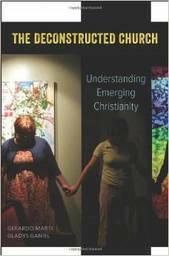 What emerges is a wide-ranging view of new ways of being Christian. Everything is at stake. Everything is open to negotiation, yet a center remains: a devotion to God and a commitment to not go it alone. Clergy will find this a helpful and challenging read, though it may be too in-depth for a small group. Those who open its pages will be rewarded with distinct images of different ways religious communities are being formed and reformed.